The year is 1983. The state of humanity as we know it rests on the precipice of an Orwellian collapse! If we were to graph out the cultural health of a society, we might think to create a drastic cliff coinciding with the events captured in George Orwell’s 1984. We might even say that as a people, we would obviously never allow our values to become controlled by paranoia, fear, and Big Brother. Reality, however, is much less dramatic. Societal values develop from the little details, the decisions made by individuals on a day to day basis, and minute changes we allow ourselves to accept. It is in these seemingly inconsequential concessions that we choose to either be part of the solution or contribute to a dystopian future. Food for thought: Everyone is branding web cam covers for your laptop. 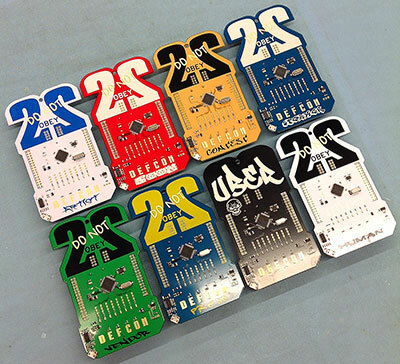 With that inspiring message, we present this year’s Defcon 26 badge created by the Tymkrs! Each badge consists of an interactive web of decisions you need to make which not only define what “kind of hacker” you are but also impacts and changes the individuals you associate with. 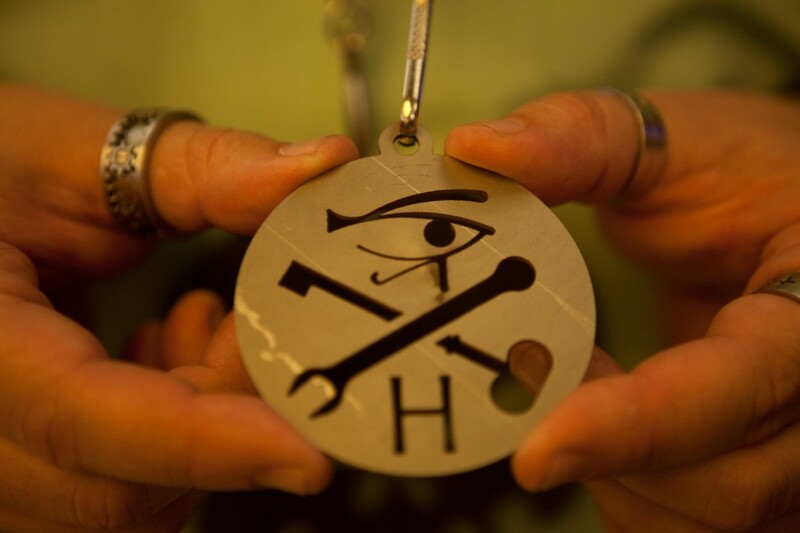 The overall design aesthetic of the badge highlights that the hacker community is found all over the world – from the hacker soldering wires in a garage to the researcher studying neural networks in a research institute. We also wanted to acknowledge that the hacker community encompasses more than those with programming or hardware hacking skills, it also includes the teachers, artists, and journalists. Each badge’s story is simple to interface with via the direction pad and + / - buttons. Your character is highlighted in green and depending on your decisions, you can move to new rooms, gain different clues, and open closed doors. Interacting with others from different groups will also help you as you work towards being the best hacker you can be. But be careful, depending on what kind of hacker you are, the red guard that roves around the same board may be your friend, or enemy. Additional clues can be found if you plug the badge in, and yet even more if you can gain control of various elements of the badge. 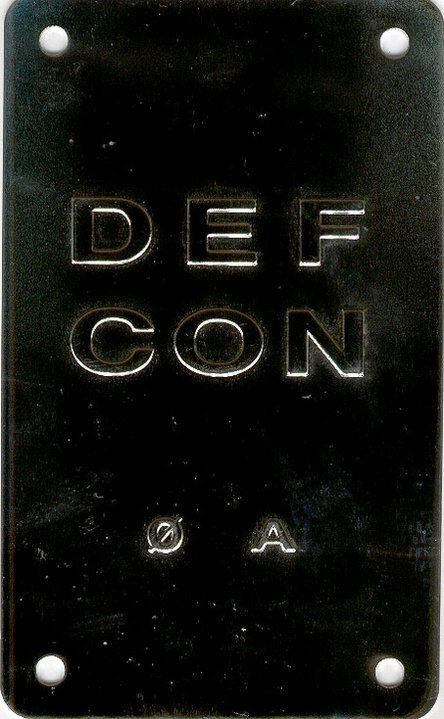 The balance of what kind of hacker you are is reflected in the DEFCON logo between Red and Green lights. Each choice that contributes to a dystopian future will be reflected in Red, and each choice that helps future hackers will be reflected in Green. Here’s to a greener future! 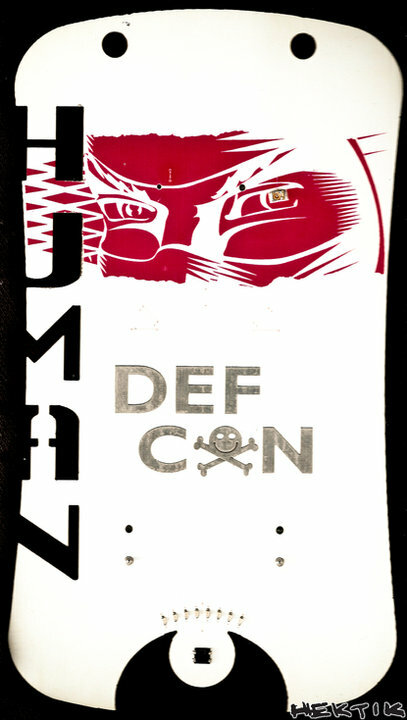 Enjoy the DEFCON 26 Badge! 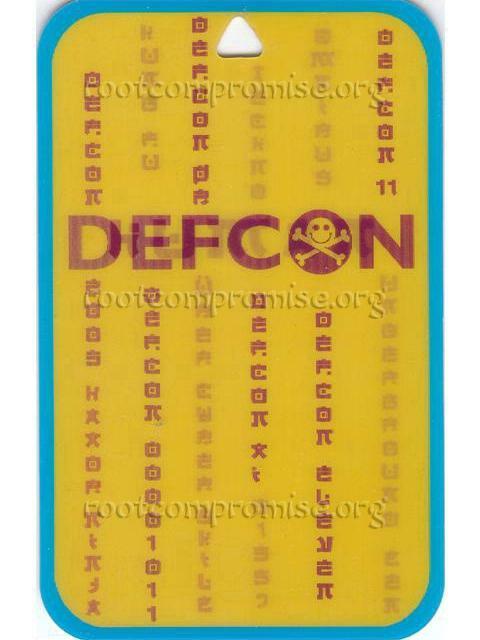 Over the years the DEF CON badges have grown from simple laminated designs to highly complex electronic artifacts full of puzzles. I am proud that we were the first to introduce the concept of the Black Badge, or free admittance for life for demonstrating expert hacking skills or ability. 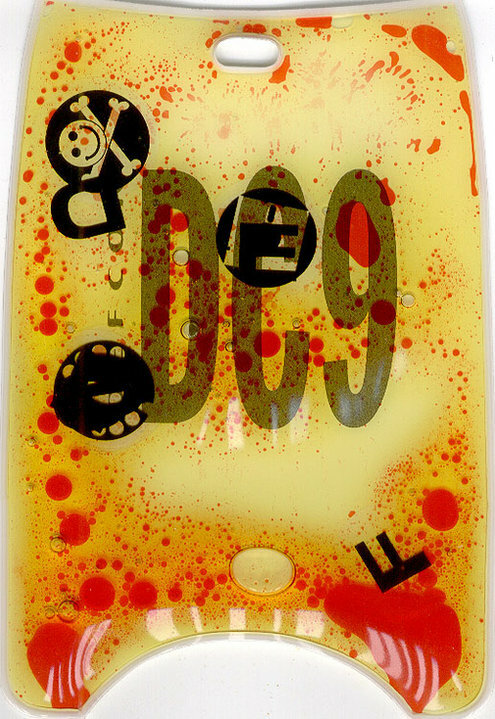 Black Beetle did a lenticular badge, a liquid filled badge, and a metal stamped badge, but when I asked King Pin to design an electronic badge for DEF CON 14 he created the now famous smiley skull badge and the electronic con badge wars began. L0stBoy took it to another level by increasing the complexity and uniqueness of the Uber black badges. After 24 years it actually becomes more difficult, not less, to design and plan the badges. As the con has grown the number of badges grow, and production lead times increase. For example the second year we did electronic badges we purchased every available battery holder of that type in the US market. Planning needs to begin earlier and earlier, and that is what did us in this year. We were at deadline for the badges and the design was not ready, and so we had to switch to plan B. As hackers we always have a plan B. In 1993, I sketched the first DEF CON logo while at Dead Addict’s place. (It was refined in corel draw and produced in a continuous tone printing process from a Fiery RIP, in the only place that could do such printing in Seattle in 1993. Overtime the logo grew and changed, the icons went from 1 to 4, but this was the first. Like how there are spaces for your handle and group affiliation? Things of the past. The “Area 51” badge. It wasn’t the first Goon Staff badge, but I went through a lot of trouble to make these look like cool official Gov’t badges as possible. I used limited edition flourescent inks printed on a Canon tabloid printer and hand cut and laminated at a local Kinkos. The first all metal badge done in aluminum. This was also a “Plan B” badge and a rush job. We payed crazy rush fees at a local Seattle company that also makes signage for companies such as Boeing and IBM, but the result was great. We have done a other metal badges of various degree of difficulty since, but these were the first. The liquid filled squishy badge designed by Black Beetle. If you’re lucky enough to have one of these original badges, I envy you. This was a brand new manufacturing process and we took a risk on them. Would they pop? Leak? The cool factor was worth it and they turned into one of our most iconic badges. One of the more difficult badges to counterfeit during the con, I’ve been looking for something similarly cool ever since. The rocket ship badge that year had its own cool design by Black Beetle. 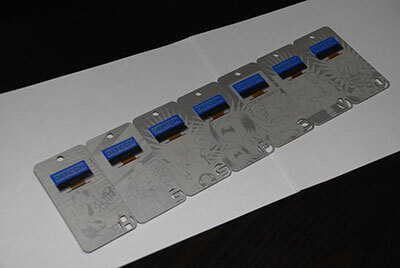 It again as a new production process with clear material, color, and silver foil stamping in a custom die cut shape. The art was inspired by Ghost in the Shell. The iconic first electronic badge by KingPin. While simple in design these badges were awesome. They used brand new PCB colors to designate different departments, and we even did a limited run of them using gold for masking, the first time it was ever done by the manufacturer! At closing ceremonies we turned off the lights and the room glowed as we played a song created during the badge hacking contest and it was like a being at a concert of your favorite band. The feeling of community was amazing. You can listen to the song by downloading it from the https://dc25-media. defcon.org/ media server. 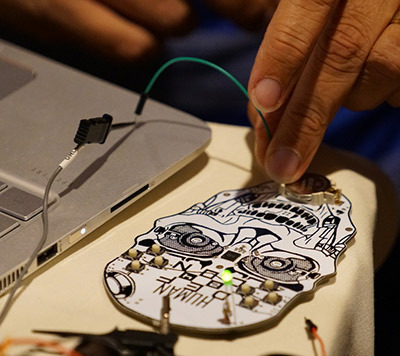 With art design by Neil and engineering from Kingpin the electronic puzzle badge was the first designed specifically to get all the attendees to seek out and interact with each other in an attempt to assemble and wire it up. You had to get ALL the pieces together, including a super rare Uber badge, to form the whole circle and circuit. 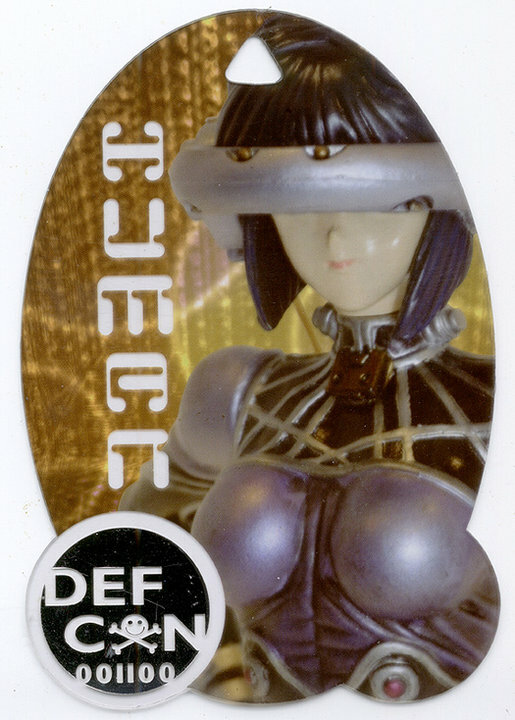 Since then we always think of ways to use the badges to get DEF CON hackers to work together to solve a problem. The Uber titanium skull badge by L0stBoy. Just look at it, it’s cool, it’s tough, it’s not breaking anytime soon. Going all “Maker” on us L0st went with a more difficult tempering process that produces one of a kind multi-color finish. If you see someone with one check it our under a bright light to see what I mean. Welcome to DEF CON 24. If you’re new to the conference you may be wondering what some of the theatre of entropy is that is being performed all around you. A part of that is the cryptographic puzzle challenge, most often referred to as the badge challenge. The focal point of the contest being the 1o57 room (you can find it on the map in this program), a room where individuals and teams associate with each other, and those interested in the games. 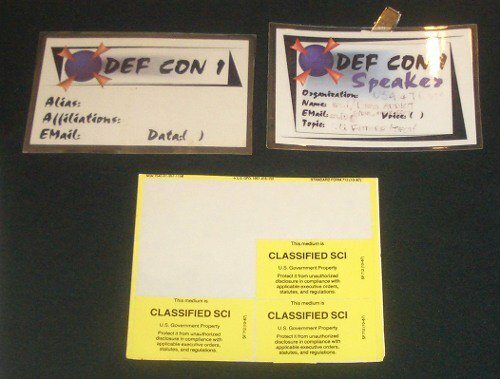 As the quest is multi-faceted, there are mini “sub-puzzles” scattered throughout the DEF CON festivities, some are tradition, some are trivial to solve, and others, well it is a black badge contest that earns the victors free entry into DEF CON for life (not to mention bragging rights!) Still confused? Stop by my 101 talk. Speaking of badges, this year was less of a dev board, and more a design to put the processor in your hands. x86 compatible, the chip is great fun, x86 ! I hope to see experimentation after the conference is over. More will be revealed after the conference, as many of the badge secrets are part of the contest. Meet some new people, try your hand at some of the puzzles, and have a good time. As is par for the course, I had to do something special for the über badges this year. My personal studies this year have brought me to feel a close kinship with Richard Feynman- who was a great hacker. This year’s über was inspired by him. Speaking of the Air Force, (because chemical reactions that have more kick than high explosives just weren’t enough) I decided to also go nuclear- as each of the points on the über badge houses a different form radioactive material. The first corner holds a glass, Uranium doped marble. These were made by adding Uranium to glass while it was still in a molten state. Each marble contains 3% Uranium 238 (by weight). Just for fun, I put coarse granular Europium phosphorescent powder underneath each piece of glass, which can be seen from the underside of the badge. This powder should glow for approximately 30 hours after 10 minutes of exposure to light. The second corner holds a small vial of tritium, housed inside a small crystal skull. Tritium is a weak beta emitter, and these vials will glow (without exposure to light) for approximately 20 years. Tritium is commonly found in exit signs and on watch faces or gun sights. Tritium vials are not approved for sale in the United States (ownership is ok- and you CAN buy them in the UK), so be sure to stop by opening ceremonies if you want to hear more about the sourcing story here... And just for fun under the tritium skulls are Uranium ore samples (consisting of Carnotite, Uraninite, Gummite, Pitchblende, and Uranophane). Finally, for those unaware, the contest surrounding the badges every year is fierce, and one of the most difficult to complete at DEF CON. It is structured to be solved in groups, so I encourage you to introduce yourself to someone new, and try your hand at the contest. With all of the issues surrounding the badges each year, one might come to believe that there might be a curse. I remember Joe talking about working on the badges on his honeymoon, and not being one to break with tradition I too had the dubious honor of working on the badges on my honeymoon. eChan and I met through her participation in the MysteryBox challenge (she is a gifted cryptographer and code breaker) so she was very forgiving of the work I had to do on the badges in the midst of the temporal demands a wedding creates. 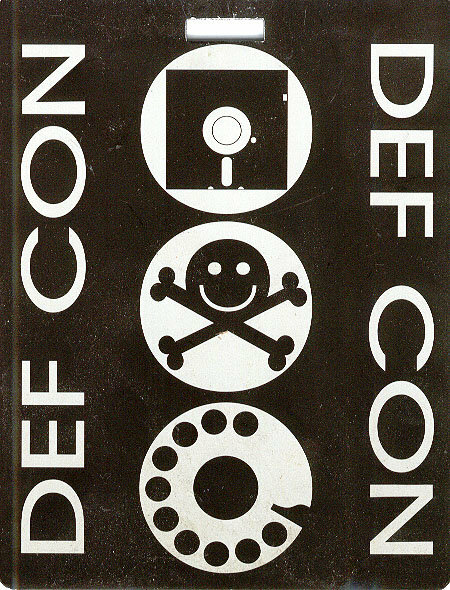 Even so, knowing how busy life would be I called in a huge favor from my longtime friend Jonny Mac, without whose help I would not have made it in time for DEF CON 22. The folks at Parallax (KenG) were also amazing, and I’m happy to tell you that the badges were made in the U.S.A. The “They Live” theme of this year drove the design and direction we decided to go with the badge. Every effort was made to encourage experimentation and use of the badge long after the conference ends. The circular pads with center-connecting trace are ‘modpads’, that allow parts to be disconnected from the circuit by cutting the middle with a razor blade, or added back by simply soldering the two pad halves back together. We also went with standard spacing on the breakouts for the I/O to make it easier to create shields, add-ons, and for general use. You can load experimental code to RAM, leaving the EEPROM untouched – so please have a go at changing around the code. Having a multi-core processor on your controller means no fussing with interrupts. 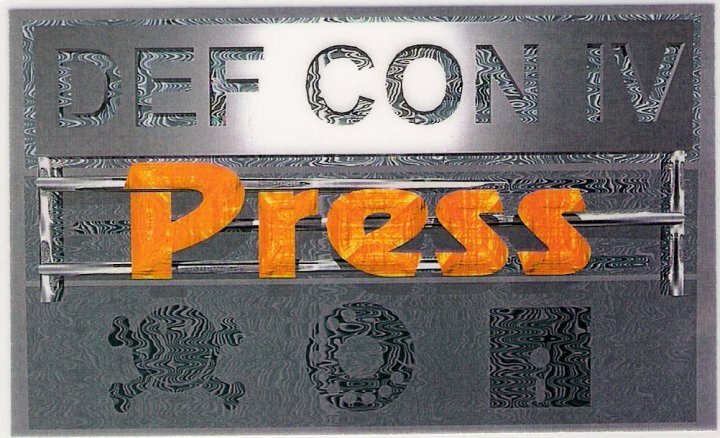 As usual, I can’t give away too much – as the badge challenge is an Uber -badge contest – but I do have some cool news — Parallax is announcing that they are open-sourcing the Propeller at DEF CON this year. We will be awarding prizes for cool and interesting badge hacks, so have fun modding…if you’ve got something especially neat be sure to stop by the 1o57 room. A hacker in the Vegas desert…sounds crazy, no? But here at our little conference you might say every one of us is a hacker. Trying to scratch out a leet, simple 0day without breaking too much crypto. It isn’t easy. You may ask, why do we stay up all night coding if it’s so difficult? Well, we stay up because we’re hackers. And how do we keep our focus? That I can tell you in one word…predisposition! Because of our predispositions, we’ve kept our focus for many, many years. Here at Defcon, we have predispositions for everything. How to sleep. How to eat. How to work. How to wear clothes. For instance we always keep badges around our necks and always wear black t-shirts. This shows our constant devotion to gaining knowledge. You may ask, how did this predisposition get started? I’ll tell you. I don’t know. It was quite a challenge getting PCB layout software to function as graphic design software, and the fab house didn’t quite know what to make of the gerbers I was sending to them. I love using systems for things other than their intended design like that. The mechanical watch movements in the Uber badges this year are homage to my grandfather, who was a watchmaker. I hope we can all approach our craft of security with as much precision, skill and honor as grandpa had. Also, with DT’s permission, I’ve decided to break with a few Defcon traditions this year. If you’d like to know what those deviations are, come to the opening presentation- but here’s a hint: forewarned is fore armed. My goal last year with the badges was to foster communication amongst attendees. There was phenomenal participation in the 'mysteries' tied to the badges and the conference, and I hope that everyone had fun. Helping build the hacker global community is a great side benefit that I always hope I can be a part of. This year I decided to try and combine the awesomeness of the legacy of electronic badges Joe had set, with the well-received badge challenge from last year, but with a twist - rather than handing you a purposefully designed circuit for hacking, I've tried to give you a development platform. A platform that hopefully you'll take home and use. I went with the Propeller ucontroller for a number of reasons. It's no secret that I used to work for Parallax, and as such have experience with their chips. All of the software for programming the Propeller is free, and there's quite a variety; C, ASM, SPIN- and if you're feeling nostalgic a Z80 emulator and a C64 emulator in the works as well. The chip itself has 8 32-bit processors, so the pains involving interrupts and timeslicing are non-issues. Fabrication of the badge was all done in the US this year as well, to avoid all the import issues DEF CON has encountered in the past. The VGA and PS/2 connectors were left off of the build intentionally, so that the badge is lighter while you wear it at con- but everyone got them as encouragement- either to visit the Hardware Hacking Village and attach them here, or to solder on at home. Now you have an excuse to finally learn to solder if you haven't before. 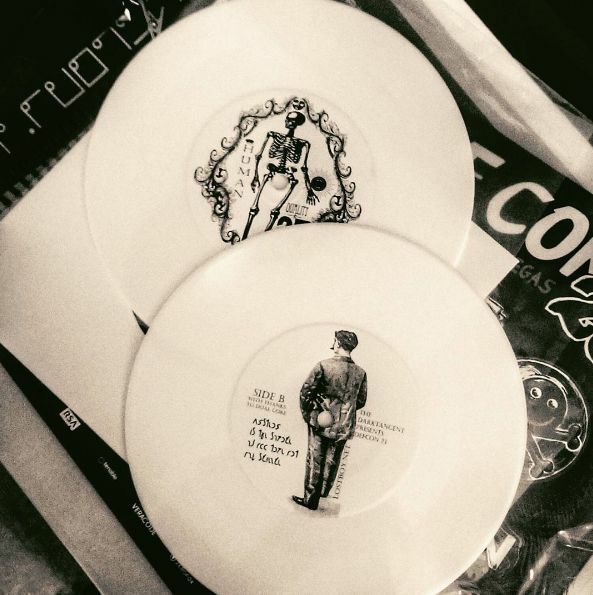 Drop by the HHV, they'll teach you. You can power the badge via the USB connection or batteries, either one. The USB connector can be used with a serial terminal (some output may already be there on boot, hint hint), and I've broken out I/O pins (on the top) for your hacking pleasure. 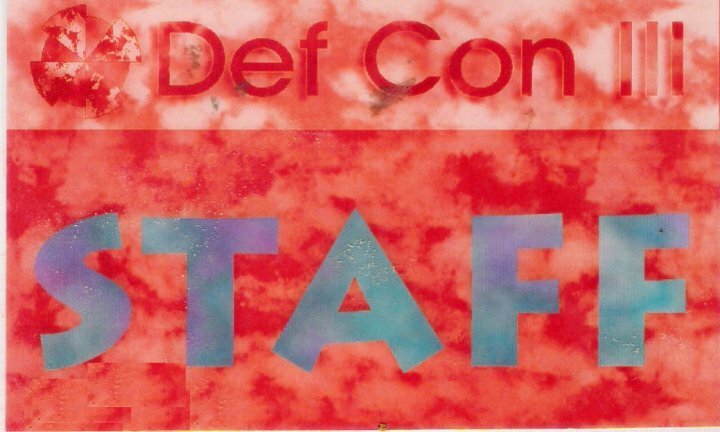 Happy 20th DEF CON. Thanks DT. How to guides for getting started with the DEF CON 20 badge, by Parallax, the manufacturers: http://forums.parallax.com/showthread.php/141494-Article-Parallax-Propeller-on-DEF-CON-20-Badge-Start-Here! So you’ve arrived at Defcon. You stood anxiously in line for reg, wondering what the badge will be like this year. Finally it’s your turn. Your heart races as you hand over your money and are handed your badge. But something is amiss! Where’s the gameboy on a string you waited all year to receive? 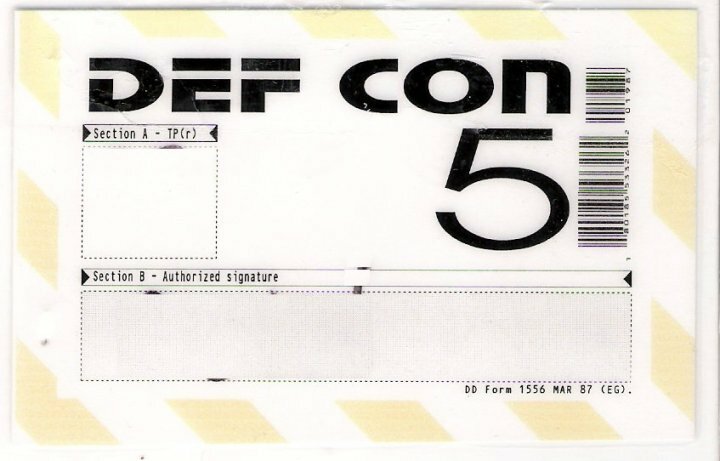 That’s right, Defcon’s not doing electronic badges this year. Electronic badges are so common place at security conferences now it has become passé. So DT asked me to try something different. Percentage wise relatively few people participated in the hack the badge competitions when they were purely hardware based. This year I hope to change that. 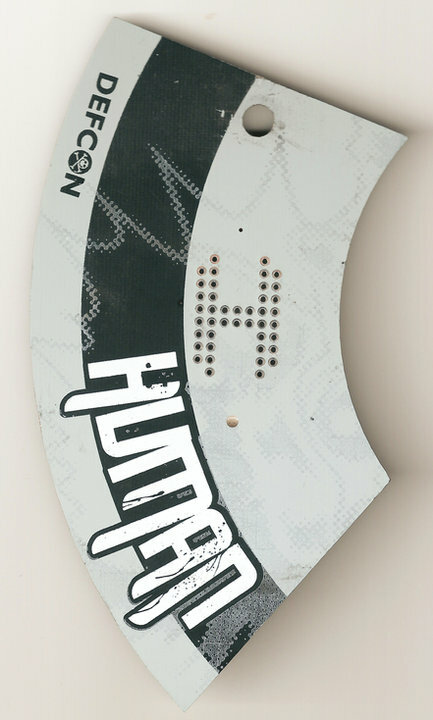 As a hardware person myself I would have enjoyed creating an electronic badge, but if we did electronic again my good friend Joe may as well have continued with his awesome designs. Moving to a puzzle based reality game will open the playing field to a larger percentage of attendees. As is typical in my contests, each stage has multiple levels of difficulty, from the pretty easy to the “how the hell did they figure that out”. Above all I hope the game is enjoyable, and fosters meeting and talking with others. Made from 0.040" thick Commercially Pure titanium, each Badge weighs approximately .05 ounces. Sheets of material (produced by the Kroll process) were stacked four thick, and fabricated via waterjet (think squirt gun from hell, cutting via erosion). Ti has a linear coefficient of thermal expansion approximately 50% that of stainless steel, making it ideal for use in aerospace and missile applications. The cut pieces were then deburred via tumbling and antiqued/oxidized by raising their temperature to 1000 degrees in an industrial kiln. The antiquing effect was intended to make the metal look old and worn in support of badge game ambience. 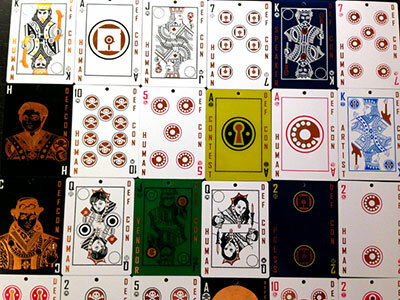 All production was done in the United States. The number of badge designs is not being released as but suffice it to say it is much larger than the standard seven, namely (G)oon, (P)ress, (V)endor, (C)ontest, (S)peaker, (H)uman, and (U)ber. See how many variants you can find. I’ve hired a professional actor for the reality game to perform throughout the conference, and added little puzzles here and there for everyone’s amusement. Easter eggs accompany all of the mini-puzzles, and overall score will be adjusted in proportion to easter egg difficulty. 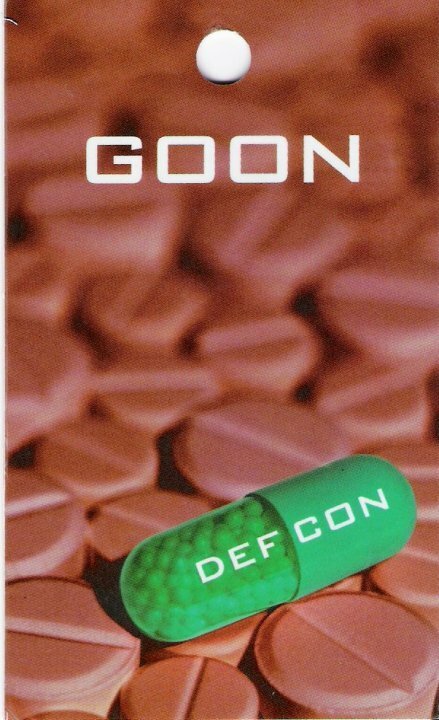 A lot has happened since DEFCON’s first electronic badge five years ago. 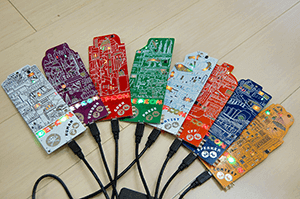 The badges have blinked patterns of LEDs, allowed you to create your own custom scrolling text messages, turned off your television, transferred files from a SecureDigital card over infrared, and pulsed to music using Fast Fourier transforms. People have hacked their badge to become a flame thrower, an audio VU meter, a password generator, an amusement park game, an anti-surveillance system, a blue box, and a polygraph, just to name a few. One group even turned my Ode to the DEFCON 15 Badge poem into a rap song. We’ve used technologies like capacitive touch sensors, jumbo LEDs, RGB LEDs, MEMs-based microphones, and microcontrollers ranging in size from tiny 6-pin devices to powerful 64-pin behemoths. We’ve used small coin cell batteries and large camera batteries. We’ve supported accelerometer and 802.15.4/ZigBee wireless features along with a bunch of hidden and secret modes that most people never took advantage of. Badge development has happened on airplanes, in shuttle buses, on my honeymoon, in hotel rooms, and while on safari. Badges have arrived with plenty of time before DEFCON and twice they’ve arrived the first day of DEFCON, much to the chagrin of thousands of people who had to stand in line to exchange their temporary paper badge for the real deal. 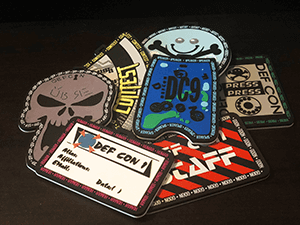 And, we’ve run out of badges every time (contrary to popular belief, estimating the number of people who will be coming to DEFCON is not a trivial matter). 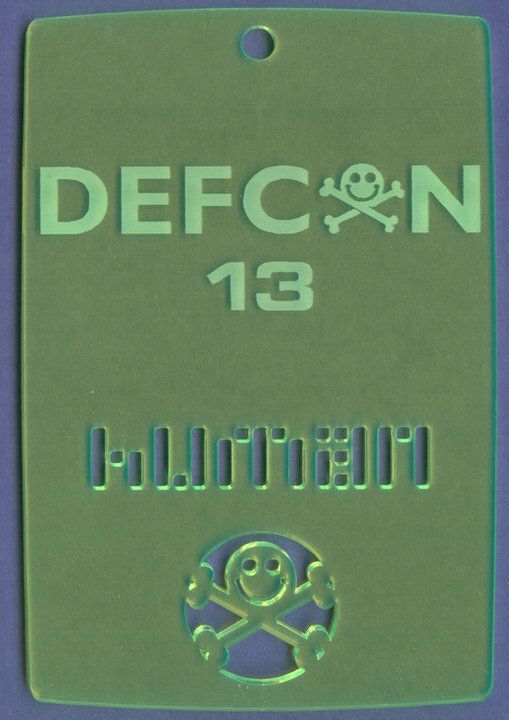 The DEFCON 18 Badge is a culmination of prior years’ experiences, both good and bad. The pièce de résistance is a 128-by-32 reflective cholesteric LCD by Kent Displays. This module was originally designed for use in Verbatim InSight USB Portable Hard Drives and has since been made available to other customers. A key feature of the display is that it requires no power to retain the image on the screen, making it ideal for battery-life challenged applications like the badge. A Freescale MC56F8006 Digital Signal Controller (http://tinyurl.com/mc56f8006-info/) serves yet again as the heart of the unit. For those keeping score, these are the pieces we tried to get through Chinese Customs last year for DEFCON 17 after our original quantity was detained. These were also held, but eventually released to me two months after the conference. Firmware development is done with CodeWarrior for 56800/E Digital Signal Controllers Special Edition (http://tinyurl.com/mc56f8006-dev/) and on the DEFCON CD). 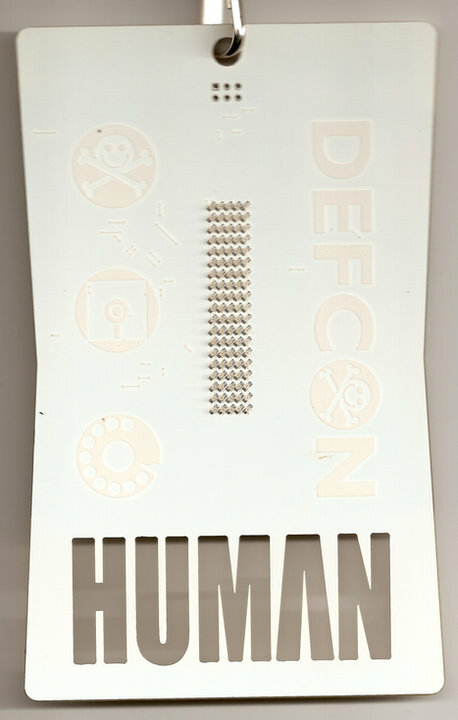 In our quest to create a never-been-done-before artistic element, we laser engraved the DEFCON 18 artwork onto aluminum substrate printed circuit boards, a feat questioned even by e-Teknet, our trusted fabrication and assembly facility. We avoided Customs delays by shipping through Macau, a special administrative region with different rules and regulations than mainland China. We reached out to the DEFCON community to invite people and groups to hide functionality or chunks of data within the badge. We’ve listened to your comments and provided a USB connection for simple firmware reprogramming via static bootloader, a JTAG footprint for those who accidentially brick their badge during hacking, and a command-based API for controlling the LCD to make it easier for non-hardware people to get involved in badge experimentation. Whether this is your first time at DEFCON or you’re a seasoned regular, I strongly encourage you to poke around and see what your badge can do. Modify it, break it, learn something new with it. Participate in the Badge Hacking Contest where the most ingenious, obscure, mischievous, or technologically astounding hacks will win prizes and fame. Use it to teach your friends or your kids about electronics. Design a new product with it. Sell it to someone else. Just don’t let it go to waste. 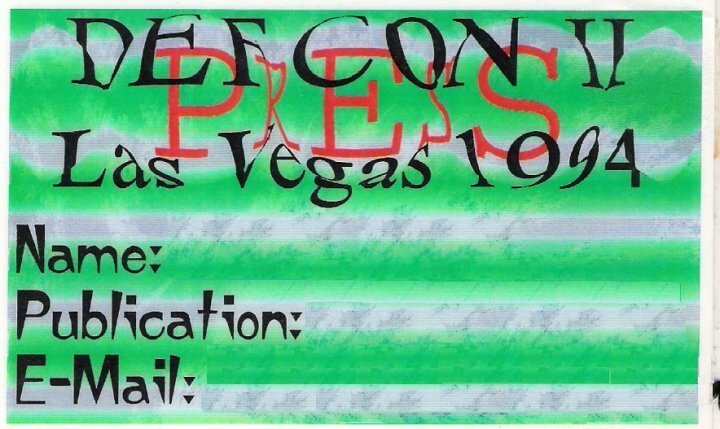 A lot has happened since DEFCON’s first electronic badge five years ago. Within the hacker community, conferences and parties using electronic badges have become the norm. What used to be a unique exception is now the rule. As one who doesn’t like to follow trends, I don’t know what next year will bring. Just expect the unexpected. Badge starts up in Receive Mode. Press button to change modes. Next mode is Transmit Mode. If no SD card inserted, enters TV-B-Gone Mode. Turn off all TVs in range. Hack IR LED for wider propagation and higher brightness. Next mode is Sleep Mode. Wake up with button press. Insert SD cards into two badges. SD card must be formatted as FAT16. Desired file to transmit must have read-only bit set and in / directory. Maximum file transfer size intentionally limited to 128KB. Hold one badge up to another badge. Enter Transmit Mode on one badge. Transfer data via IR at a speedy 776 bits per second. When progress bar finishes filling or emptying, transfer done. The further away you are, the less likely it will work. Transfer will abort if bad CRC, no data received, or button pressed. Trade warez with other hackers. 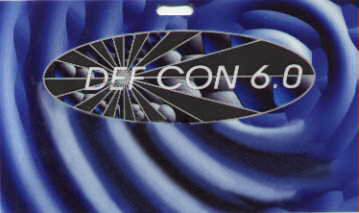 Look at source code, schematics, and other badge inf0z on DEFCON CD. Impress Kingpin to win prizes. Spend time in the Hardware Hacking Village. Own hotel TVs or control your BSODomizer with infrared. Battery will last way longer than DEFCON does. This year’s badge is based around a freescale mc9s08qg8 microcontroller and contains a matrix of 95 surface-mount leds (5 columns by 19 rows) to allow user-customizable scrolling text messages. It requires two cr2032 3v lithium coin-cell batteries. Optional circuitry (fully designed, but unpopulated on the final badge circuit board) supports a freescale mma7260qt triple-axis accelerometer for motion-control applications and mc13191fc 2.4ghz rf transceiver for 802.15.4 Or zigbee applications. It’s completely hackable. Wear it, use it, modify it, break it, learn from it. 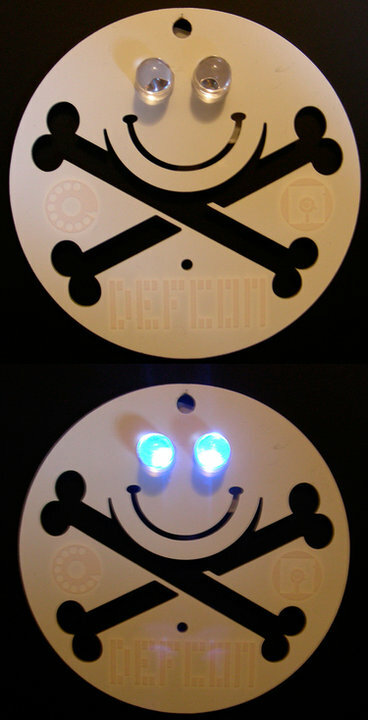 The top three most obscure, obscene, mischievous, or interestingly hacked badges will be recognized and awarded at the defcon award ceremonies on sunday. Yes, it’s purely subjective and I’m the judge. If you want your hack considered for the contest, show me your submission by 2pm on sunday. We’ll have a table set up in the vendor area with a soldering iron, tools, and extra components for your hardware hacking pleasure, a development station set up for your firmware hacking pleasure, some folks from freescale and e-teknet for your engineering support and social interaction pleasure, and some t-shirts for your styling pleasure.